You read that right triple chocolate!!! I figured this is the month of and for chocolate lovers right? (see February is synonymous with chocolate). 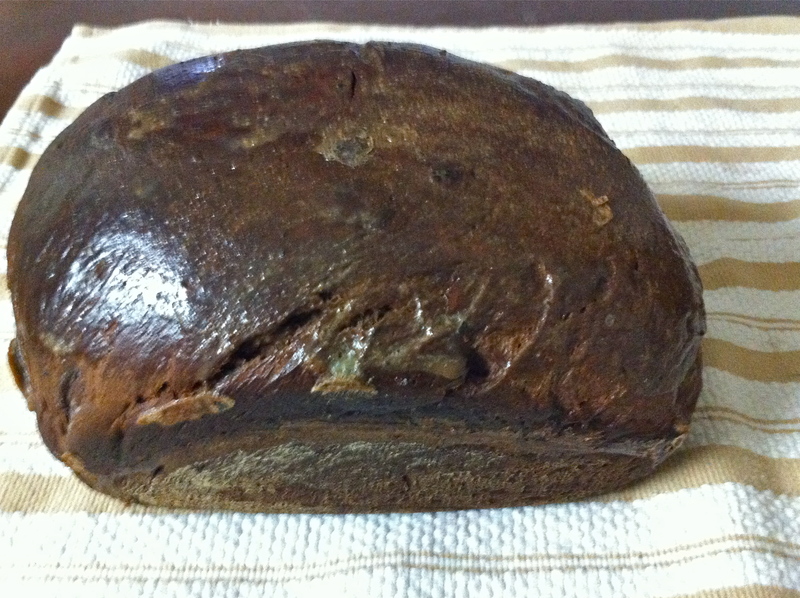 This moist bread is a cross-breed between a dark/molasses bread and a dessert bread. Most dessert bread ingredients form a sweet cake batter rather than a dough and use baking powder and/or soda to help them rise . This bread instead uses yeast, has two rises, and forms a very silk and springy dough. The base recipe I got once again from The Bread Bible but I did make some key variations. After proofing the yeast I added the dry ingredients of: flour, salt, cocoa powder (the first of the three chocolates), expresso, and sugar together. Then the wet ingredients of: warm milk, melted butter, egg, yeast, and warm water were added to create the dough. Once the dough was formed the ever so important chocolate was added. The original recipe called for some finer/fancier chocolates. 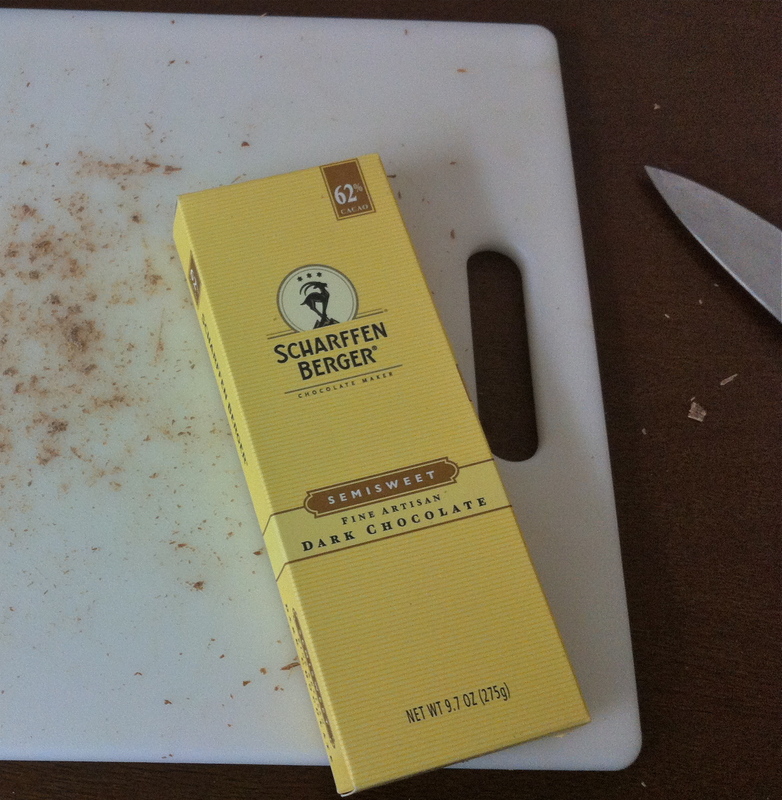 I decided to used good-old fashion Hershey unsweetened cocoa powder (instead of a fancy dutch processed variety), 3 ounces of a nicer Lindt milk chocolate bar, and 5 ounces of a semi-sweet baking bar that was suggested in the original recipe: Scharffen Berger. 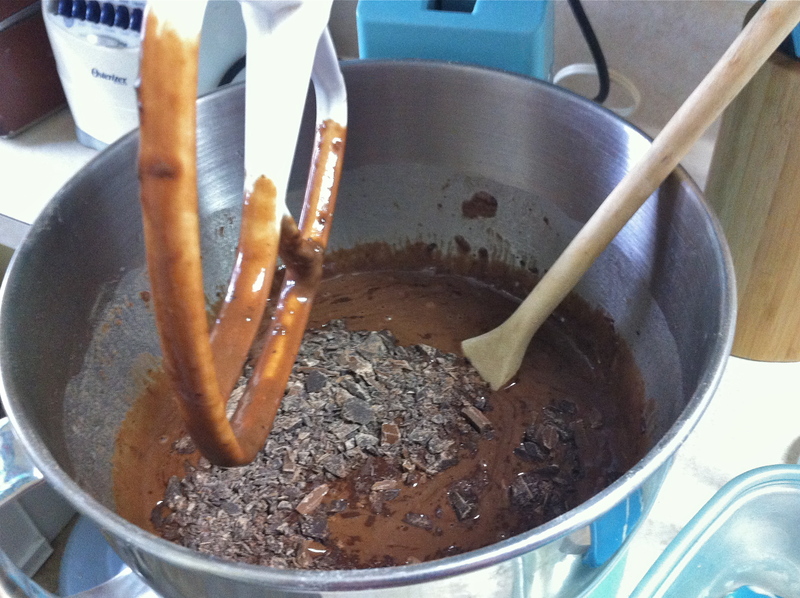 Once the chocolate was chopped it was added with a spoon to the dough. Here also I added vanilla and a little more white sugar making the dough sweeter than the recipe called for. Then the rest of the flour was added 1/2 C at a time to the mixer. After switching over to a dough hook for awhile, I turned it over by hand to check it’s consistency. I used butter to grease the pan the dough would rise in instead of the olive oil base I would normally use for a non-dessert bread. The dough sat and rose for an hour and half. During this time I decided to create a glaze, also not in the original recipe. I used a tablespoon of my coffee creamer (see Coffee Creamer Simplified ), 1/8 tsp of expresso, a tablespoon of melted bittersweet chocolate, and one egg whisked together. Once the dough finished it’s first rising I kneaded it to let out air and formed it into loafs. The original design is to make the dough into two round loafs. Instead I formed the dough to fit two regular bread loafs pans, greased again with butter, for it’s second rising; about another half hour. 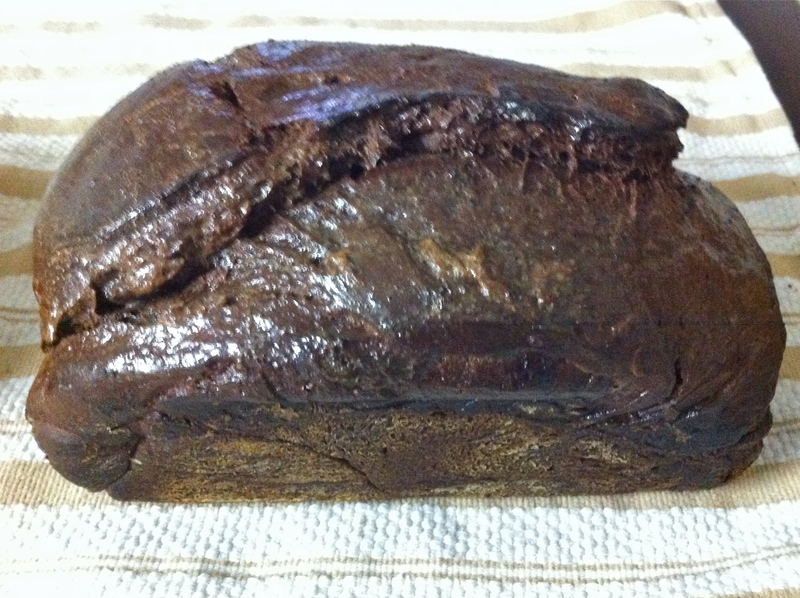 After the second rising I glazed the tops of the loafs and stuck the bread in the oven at 375 F.
Let me tell you combine the smell of brownies and fresh bread baking and you’ve got close to what our house smelled like while this bread cooked. It went in the oven for about 45-50 minutes . I chose to take it out around 30 minutes to re-glaze the top; then did that again after 45 minutes and turned the oven down to 200 until the glaze was absorbed. At 50 minutes I had three layers of sweet glaze on top of the bread and the center was done. The end result? Not necessarily the prettiest bread I have ever made but one of the most delicious. 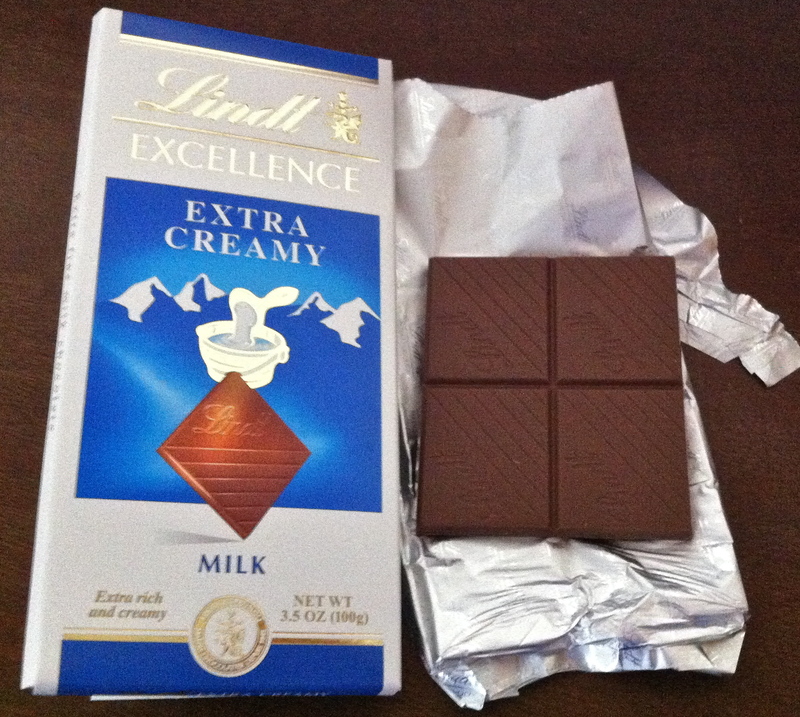 With a crunchy sweet top layer and a moist yet dense semi-sweet chocolate flavor it is wonderful. Once the loafs cooled I placed them covered in the fridge. The next morning Luke andI had a slice without butter with homemade vanilla lattes for breakfast. Talk about a piece of heaven!! I think it honestly tastes better the next day! So there you have it! A very February tribute to bread. If you are thinking of finding this recipe or something similar there are definitely ways to add variety to the recipe. 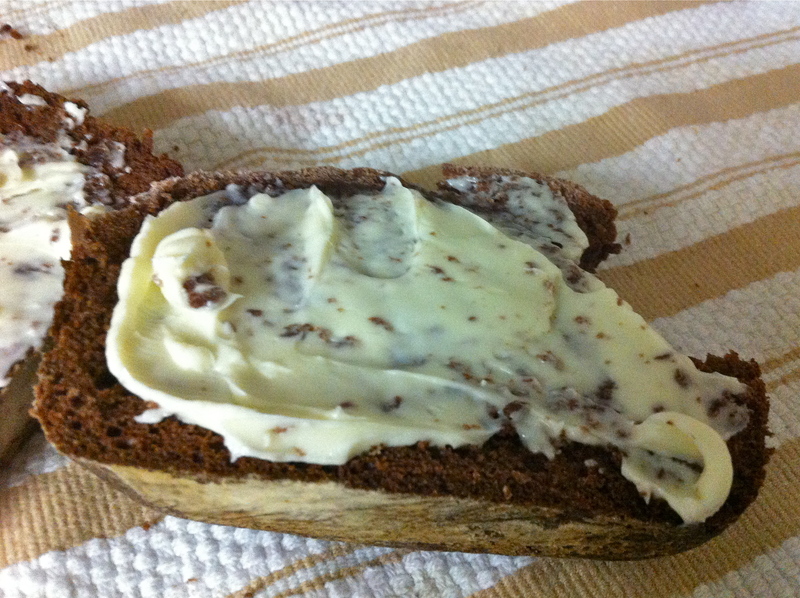 If you want the bread sweeter I would suggest adding more white sugar to the dough along with more milk chocolate and/or add chocolate chips. You can also of course add a sweeter glaze and or icing to the top. The more the glaze the quicker the top will brown so you have to be cautious. You can always cover the top with foil while the rest bakes if necessary. 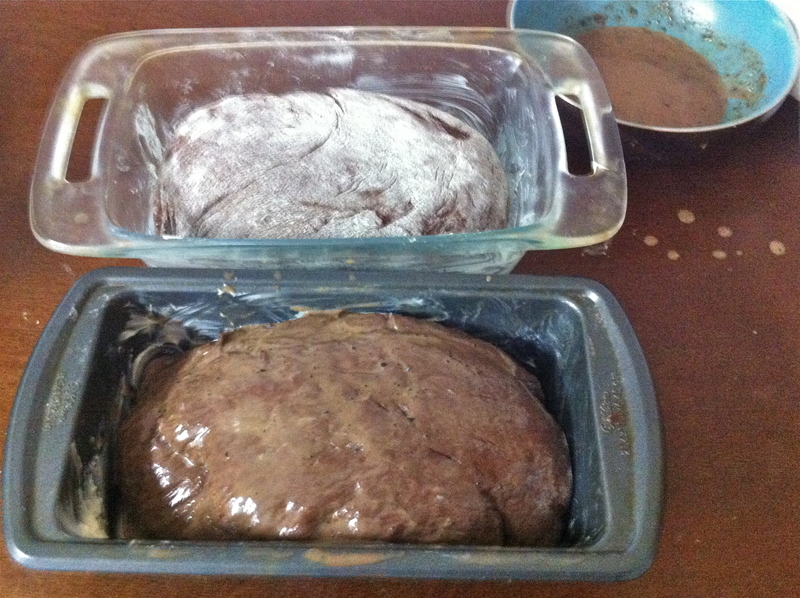 For an icing I would suggest melting semi-sweet chocolate and combining it with a little milk/cream and powdered sugar to put on once the loafs have cooled.